For a while now, my girls have been asking for a dog. "Oh we'll look after it, it will be so good." When I ask what type of dog they want, Goose always says: "A pink one!" When I tell them there's no such thing as a pink dog they're bitterly disappointed. "But we LOVE pink!" 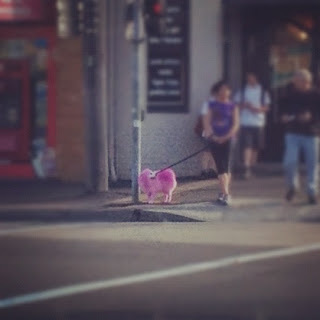 "I promise you there's no such thing as a pink dog," I tell them. Goose likes to make mischief. She's not always good at it and obviously sneaks things behind her back and gets so cross when I ask her what's she's hiding. "How do you know everything?" she squawks at me. "I'm your mum, it's my job," I tell her. Yesterday, as we picked up Lil from school, I was just pulling up to the traffic lights when she yells out: "Oh my goodness, I can't believe it! It's a pink dog!" Goose was beside herself. "See! I knew it! There is a pink dog. I told you there was. You don't know everything. You and Dad don't know everything," poured at of her mouth. I don't think they'll ever believe a word I say again. Have you ever been caught out like that? I tell my niece and nephew slight variations on reality all the time - but they are not the best at catching me out! There goes your cred, Mum! Or is it that owner's cred I'd be concerned about?! Hahahaha that is fantastic Corinne! I would never ever dye a dog's fur. Does this mean you have to get one for them now? What's the traditional Mother's Day dance?